Ajay Parikh heads Wipro Infrastructure Engineering’s Additive Manufacturing (3D) business. An electrical engineer, Ajay re-joined Wipro in 2016 to lead the company’s foray into Additive Manufacturing. During the course of his career, Ajay has been actively involved in starting up businesses from conceptualization, identification of opportunities for introducing new business lines and growing and scaling existing businesses,. 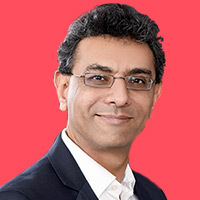 In an interesting career spanning nearly 25 years, Ajay has held leadership positions in domestic and international Manufacturing, IT, ITES, and Social Re-engineering companies. Ajay led the design, implementation and reorganization of the global workforce talent management system, during his earlier stint with Wipro. He leads Ops Transformation as head of India Heritage Foundation that manages the world’s largest free meal program (Akshaya Patra) for underprivileged children.